We've already told you it's time to start living in a marketing flywheel world, and now we have the tools to back it up. We've seen the creation of the Marketing Hub to support your marketers in attracting visitors and converting leads. Your sales team is already using the Sales Hub to nurture prospects and close deals. With the launch of HubSpot's Service Hub, we now have proof that your customers have equal focus within a prosperous business. Here are our three favorite features of Service Hub to help your customer service team succeed. Your marketers and sales representatives are already saving time on their mundane, routine tasks by setting up workflows and automating them. This frees up their work days for the important activities of attracting visitors and closing customers. With the introduction of Service Hub, your customer service team can now benefit from these tools. For example, they can now set up customer service workflows that turn incoming service requests into tickets to automatically route them to the appropriate team member. This addition spares everyone supporting your marketing flywheel from dreadful, manual data entry and gives them more time to dedicate to helping and supporting your customers, prospects and visitors. Conversational marketing is a growing opportunity for marketing and sales, but did you know it can also serve your customer support efforts? When you add live chat to your website, not only are you able to direct visitors to helpful content and resources, but you also enable on-demand conversation with customers to offer assistance and troubleshoot issues. But wait, it gets better! All of these chat conversations are logged in your universal inbox, so your entire customer support team — plus marketing and sales — can easily track interactions across your communication channels. With everything logged in a single inbox, you'll avoid letting any request slip through the cracks and provide a more cohesive experience for your customers. With this integration to your chatbot, service team members will also have access to a customer's entire contact record, so they can provide even more relevant and personalized support. Net Promoter Score surveys measure the willingness of a customer to promote your product or service to others. In a service mindset, this means it's measuring the success of your customer service efforts as well-served customers will be more likely to recommend your brand. With Service Hub, you can now send out NPS surveys after each customer engagement to gauge their happiness with the support. You can then use these immediate insights to further improve your customer experience, refine your product, polish your marketing and sales funnel and, ultimately, grow your business by retaining happier customers who promote your product. 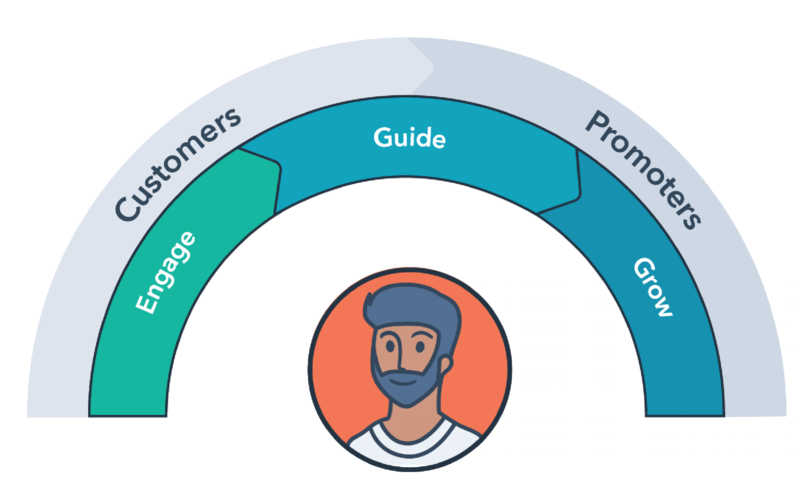 We are officially living in the era of the marketing flywheel where customers at the center of a successful marketing, sales and service strategy. With the launch of Service Hub, your customer support abilities just got a facelift. By using these tools (and more), your team can focus more on assisting your customers, offer an on-demand communication channel and quickly gauge the success of their efforts.